The Lansing Area Ministry of Bells (LAMB) was founded in 1984 by Jane C. Wright to promote the art of handbell ringing and to provide a structure to support the Spring Ring, a local massed ringing event held in the Lansing, Michigan, area each year in the late winter or early spring. Jane also founded the Capital City Community Ringers (now the Capital City Ringers, Inc.) in 1984, and directed until the spring of 2015. The Lansing Area Ministry of Bells and the Capital City Ringers Handbell Ensemble are officially sister organizations. Jane, who is currently the Minister of Music at Westwood United Methodist Church in Kalamazoo, was for many years the Minister of Music at Mt. Hope United Methodist Church in Lansing and directed the handbell choir there. L.A.M.B. sponsors two events; the Spring Ring and the Beginning Ringers & Directors Workshops, each spring and fall, respectively. The major event sponsored by the Lansing Area Ministry of Bells is the Spring Ring, a gathering of about 100 ringers from about 10 churches each year. We have had many well-known handbell directors and composers/arrangers as guest conductors of the Spring Ring, such as Arnold Sherman, Tim Waugh, Douglas Wagner, Monica McGowan, Hart Morris, Susan Berry, Lee Afdahl, Bill Griffin, and Carl Wiltse, to name a few. Jane C. Wright founded both the Lansing Area Ministry of Bells (LAMB), which promotes the art of handbell ringing through local festivals and workshops, and the Capital City Ringers in 1984 when she discovered a need for advanced ringers and directors to ring more frequently and to ring more challenging and varied music. She continued to direct the Capital City Ringers until the Spring of 2015. Jane is the Director of Worship and Fine Arts at Westwood United Methodist Church in Kalamazoo. She holds a Bachelor of Music Education degree from Central Michigan University and a Master of Choral Conducting degree from Michigan State University. 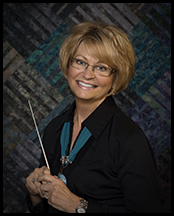 Jane has been in the mainstream of music education and conducting since 1973 and has taught public and private music education, band, choir, and handbells. She served as Director of Music Ministries at Mt. Hope UMC in Lansing for 19 years. She is a clinician for new directors and handbell ringers and often serves as a guest choral conductor. Jane has had the privilege of serving four years as Secretary on the Area V Board of the Handbell Musicians of America, and has been a clinician for various handbell events, all of which have given her the opportunity to get to know a lot of "great people." LAMB also sponsors a Ringers and Directors Workshop in late September each year. These sessions help ringers and directors gain confidence in their ringing ability and learn the various handbell techniques commonly found in handbell music. All levels of handbell ringers and conductors are invited to participate in a morning of ringing and conducting! Ringers will learn the basic fundamentals of ringing techniques as well as advanced ringing techniques. Members of the Capital City Ringers will lead the ringing classes. Nicole Leppala, the Music Director of the Capital City Ringers, and founder and past-director, Jane Wright, will lead the beginning and advanced conducting techniques. Ringers will learn a piece to be performed at the close of the workshop. Directors that attend the workshop will have the opportunity to conduct the piece with the ringers. Any questions about the Lansing Area Ministry of Bells and the events it sponsors should be directed to Secretary Lorraine Finison at BellGoddess (at) hotmail (dot) com or by calling 517.321.3221.